This past Tuesday we held our eighth annual Adopt-a-Med-Student Program Luncheon, in which we award all our first-year medical students a stethoscope provided by some of the School’s generous donors. Some donors even provided more than one stethoscope. 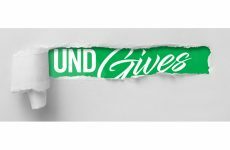 The idea behind the event is two-fold: first, to provide students with a stethoscope that they will use throughout their medical school career and beyond; second, to pair each student with a donor (who typically is a physician and usually is a UND graduate) as a friend, mentor, and advisor. 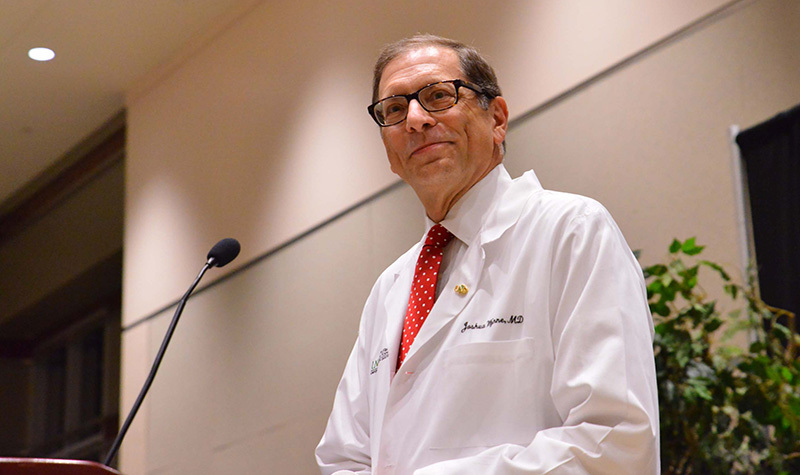 The event has really blossomed over the years—the first year we had to scramble to find enough donors to cover the cost of the stethoscopes, and for the past four years we have been oversubscribed. And we were fortunate enough to have four donors present at the event, including one who traveled all the way from Duluth, Minn. It was a fun hour, and one that I’m sure the students will remember. Recently I became aware of a fascinating study of research productivity by Professor Wade Wahls, who is in the Department of Biochemistry and Molecular Biology at the University of Arkansas for Medical Sciences. Professor Wahls’ work was brought to my attention by two faculty members in our Department of Biomedical Sciences, department Chair Colin Combs and Associate Professor John Shabb, and I am most grateful to them for pointing this article out to me. 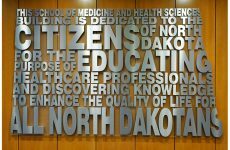 Prof. Wahls’ article, “High cost of bias: Diminishing marginal returns on NIH grant funding to institutions” (doi: https://doi.org/10.1101/367847), explored the funding that various organizations get from the National Institutes of Health (which provides more research funding to the UND SMHS than any other single source). Wahls divided his study into a sampling of what he called “prestigious” universities (like Harvard Medical School, Stanford University, and the University of California San Francisco) and “less prestigious” universities (including us). He looked at two major issues: how much funding the institutions received, and then what they did with those dollars. Not surprisingly, the prestigious universities got more dollars per investigator than the rest of us, as Noah Smith illustrated in Bloomberg Opinion. But as Smith also shows (see above chart), Wahls assessed the “productivity” of the investigators at each institution, and guess what? The list gets reversed! 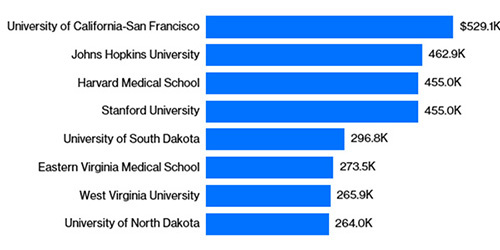 Yup—we turn out to be second only to the University of South Dakota in terms of what we did with those NIH research dollars (the impact of the research performed). Wahls speculates that these disparities in funding mostly relate to unconscious bias on the part of grant reviewers and others toward the prestigious organizations to the detriment of the less prestigious ones. 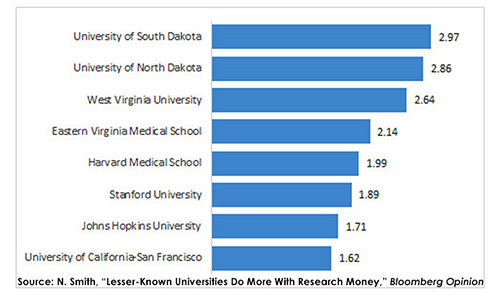 But regardless of the cause, the bottom line is that the UND SMHS does more with less—we generate more scientific impact per dollar awarded than do the prestigious schools, even though we get fewer dollars overall. Just imagine what we would do if the request by Presidents Kennedy and Bresciani for more research dollars from the state were to come true—it would allow us to do even more with more!